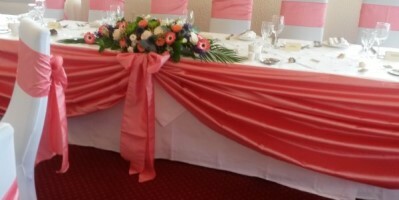 Table Runners, Swags, Bows and Skirts for Top Table, Cake Table and Present Table. Table Swags, Skirts and Runners. 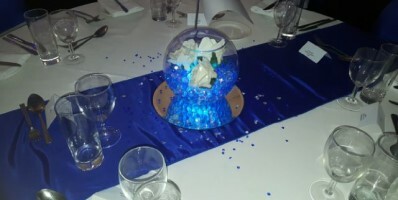 Decorating your Top Table is one of the most important parts of your venue decoration design. It is where the happy couple and their families will be seated, where the toasts and speeches will be made and will be the main focal point of the entire room for the day. We have many options available for dressing the top table to suit all budgets and tastes. 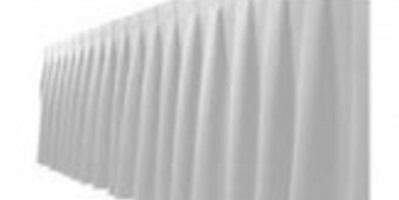 With our range of backdrops and drapes to enhance the top table from Simple and Elegant to Chic and Lavish! Table swags complete the overall look of a room enhancing the top table, cake table and even the civil ceremony table. You can choose from a variety of colours to match with your colour scheme and theme in satin, taffeta, organza or hessian. Add a magical sparkle to your top table, cake table or present table with our sparkle skirts and swags. Twinkling led fairy lights covered by a silky white skirt and swags create an elegant finishing touch to your tables. These also match our Sparkle Backdrop. Our voile swag with lights in, is an alternative option to the full Sparkle Skirt. 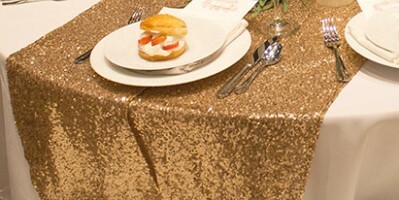 A table skirt can hide unsightly table legs and can be used with one of our swag options to complete the look. Add colour co-ordinated runners to the tables to enhance and finish off the look for your table decorations..
Add extra special bling with a sequin table runner or cloth for your cake table choose from gold, silver or rose gold.